This jacket, trousers and hat will fit a 2 inch porcelain dollshouse baby doll. The jacket has been designed with a front opening so that it can be removed from the doll. The Jacket front and back are made in one piece with the sleeves then picked up around the armholes. The neck and opening edges added afterwards. This little outfit is by far the easiest of my patterns so would suit a beginner to miniature knitting. 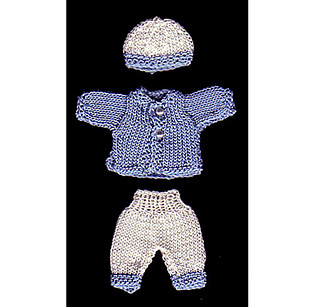 It is basically the same outfit as my Pram Suit for 3.25” Doll (14) but designed for the smaller doll. I am in the process of moving all my patterns to Ravelry and will also update them when I can. Until I manage this, each pattern will be A4 with a picture of the finished outfit and will be available at a reduced price.